Work with three generations of bakers to make dough to be cooked in MREA’s outdoor cob pizza oven (constructed out of wood, sand, straw, and clay). Includes discussion of making and keeping a sourdough culture, useful sourdough recipes, and how to bake in a wood-fired cob pizza oven. Plan on working with your hands. Take home free starter culture! 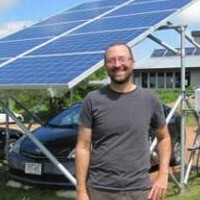 Nick Hylla is the Executive Director of the Midwest Renewable Energy Association where he works in partnership with organizations throughout the Midwest to advance renewable energy education and market development initiatives. Nick holds an MS degree in Natural Resource Management, has more than 10 years of experience in non-profit leadership, and serves as the Principal Investigator on two U.S. Department of Energy cooperative agreements as part of the SunShot Initiative. These efforts focused on reducing cost and increasing market penetration for solar PV systems have supported the development of the Midwest Grow Solar Partnership and the Solar University Network.